*Place the bananas and peanut butter in a food processor and blend. This will take some time, and you will need to stop a few times to scrape the sides. Be patient because eventually you will notice that the bananas and peanut butter will take on an ice cream-like consistency. Scoop out and serve immediately with your favorite ice cream toppings! 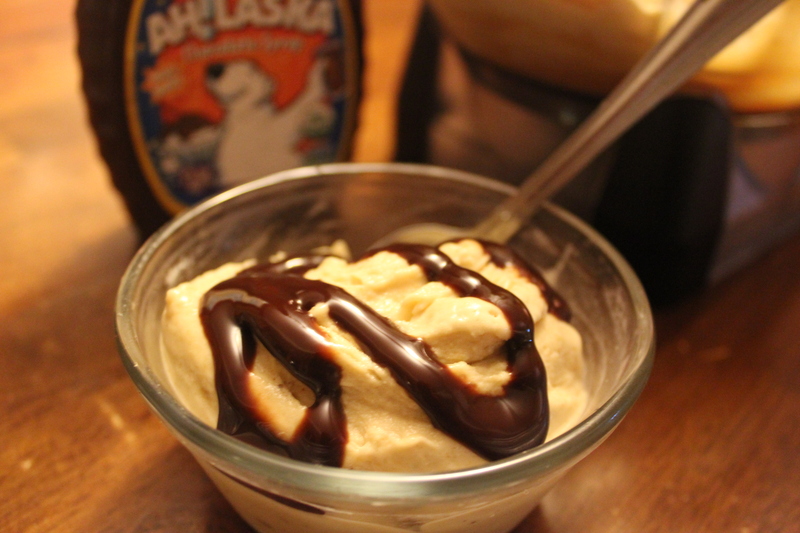 One of the toppings we enjoy is the AH!LASKA Organic Chocolate Syrup. 100% organic, dairy-free, gluten-free, peanut free and sodium free, this syrup is delightful! Ah!Laska Organic Chocolate Syrup Banana banana and peanut butter dairy-free delicious alternative to ice cream frozen bananas gluten-free kid-approved treats/snacks peanut butter potassium-filled treat snacks for kids soft-serve "ice-cream"